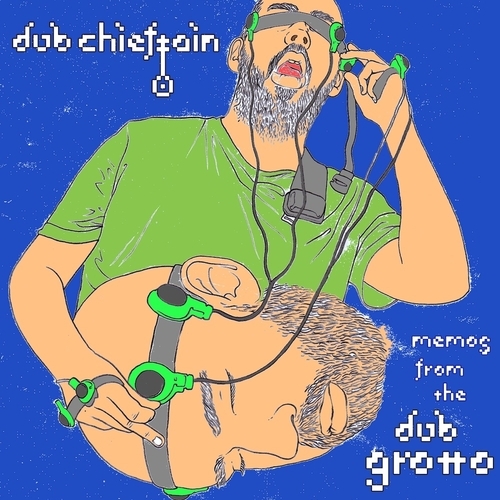 Dub Chieftain is the mythic alter-ego of Glasgow based musician and artist Eddie Coleman. in his attempt to define himself and his times using the tools of the home recording enthusiast. With the sheer force of his imagination he bends genre and circuit like a Strongman bends Iron. He establishes new audio destinies in the barren reality of urban experience. He chants down the dark sky. He started off in the clydeside town of Greenock, playing guitar in the Sunday afternoon pub-jam scene. In the days when people smoked indoors, Factory workers sang songs by peoples forced from their homes. 12 Bar Blues or Rebel Ballad. Impressionable teenagers were allowed to play rhythm guitar. Several years later, and halfway through an Art degree, he bought himself 4-track and submerged himself in the possibility of the audio-scape. These days the banjo is his broadsword. He uses it to carve a path through the web-jungle of the post-physical media-scape. His recent work combines the ancient structural concepts of Gaelic dance music with the brashness of the cheap plastic keyboard. His day-job allows him to drift across the city entering spaces deemed dangerous and off limits to the outsider. In these places he finds his instruments and inspirations. In the charity shop, the rubbish dump, condemned tower block, in the unguarded moments of the mentally unwell. For instance, "The Magic Skip" (on the CD Memos from the Dub Grotto) was written on a Gameboy he found in a bin on his way home from work. "I think its important to be hyper-aware, Like Ray Mears in a concrete forest. Everything can be used for something. The connections will come later. Trust your instincts. Allow yourself to be open. Gather. Hunt. Gather. Your survival is at stake. Your imagination is the sticky back plastic that keeps things together." Recently Dub Chieftain has been collaborating with Aberdonian electro wizard Kidquaalude. They are availible to perform live at a venue near you. Dub Chieftain - Where D'ye Come Fae?